Director of FIU Center for Personalized Nanomedicine. Physicist and Electrical Engineer by training, Sakhrat Khizroev is a Professor at two FIU Colleges, Engineering and Medicine, respectively. His research focus is on the basic study of nanomagnetic and spintronic devices to enable leapfrog advances in a broad range of applications including next-generation information processing and nanomedicine. His background in a reverse chronological order is given below. In 2011, Khizroev came back to FIU to undertake a challenging task of working hand-in-hand with his colleagues at the recently established Herbert Wertheim College of Medicine to create a world-class university-wide research initiative in the emerging field of patient- and disease-specific medicine (Personalized Nanomedicine). The main mission is to use nanotechnology to bridge advances in fundamental research with the current need in medicine. He started his medical career as a Professor at the Department of Immunology where he also served as Vice Chairman. Since 2014, Khizroev’s main appointment is at the Department of Cellular Biology and Pharmacology – the heart of cross-disciplinary research at the College of Medicine. From 2006 to 2011, Khizroev was a tenured faculty (Professor in 2009-2011 and Associate Professor in 2006-2008) at the Department of Electrical Engineering of the University of California, Riverside (UCR). 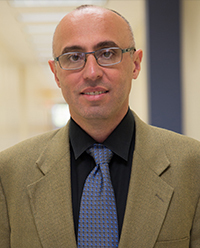 He started his academic career in 2003 as an Associate Professor at the Department of Electrical and Computer Engineering at FIU, where he was tenured in 2005. Prior to his academic career, Khizroev spent four years as a Research Staff Member with Seagate Research (1999-2003) and one year as a Doctoral Intern with IBM Almaden Research Center (1997-1998). He holds over 35 granted patents with IBM, Seagate, CMU, FIU, and UCR. He has authored/co-authored over 130 refereed papers, 5 books and book chapters in a broad range of nanotechnology applications with an emphasis on the physics of nanomagnetics/spintronics. He has presented over 100 talks including many invited seminars and colloquia at international conferences and meetings. He has acted as a guest science and technology commentator on television and radio programs across the globe. He was one of the co-founding editors for IEEE Transactions on Nanotechnology, a guest editor for Nanotechnology and IEEE Transactions on Magnetics. He sits on editorial boards of several Science and Technology journals. Khizroev received a BS in Physics from Moscow Institute of Physics and Technology, a MS in Physics from the University of Miami, and a PhD in Electrical and Computer Engineering from Carnegie Mellon University in 1992, 1994, and 1999, respectively. As an Electrical Engineer, Khizroev is best known for leading the groundbreaking 1997 IBM-CMU demonstration of Perpendicular Magnetic Recording (PMR). The demonstration, that for the first time revealed the key advantages of PMR over the state-of-the-art longitudinal recording, became the turning point that marked the shift in the multi-billion-dollar industry towards the new technology. (In 2012, Khizroev was elected a Fellow of National Academy of Inventors (NAI).) Other pioneering concepts that came under his supervision include three-dimensional (3D) multilevel memory, near-field optical transducers (Nanolasers) for 5-nm diagnostics, protein nanoelectronics, graphene spintronics, nanodevices for non-invasive brain stimulation and neural network studies, nanoparticles for drug delivery and on-demand drug release, multifunctional nanoparticles for high-specificity cancer treatment. The research activities in his group have been supported through numerous competitive grants from National Institute of Health (NIH), National Science Foundation, Department of Defense (DoD), Department of Energy (DoE), States of Florida and California, and private foundations and companies including IBM, Western Digital, Seagate, Motorola, and others. In 2015, Khizroev and his group joined NSF Center for Energy-efficient Electronics Science (E3S) based at the University of California – Berkeley. The Khizroev group’s role is to develop next-generation spin-based energy-efficient information processing devices.